Forget those holiday drinks loaded with sugar, cream, and calories. 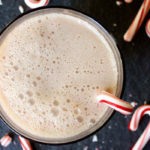 This Creamy Candy Cane Shakeology is a salute to peppermint, arguably the most festive flavor of the season. To create this healthy smoothie, we use a little pure peppermint extract for that authentic wintery kick. Sweet, creamy Vanilla Shakeology and unsweetened almond milk give this minty smoothie a rich creamy flavor. With only four ingredients, it doesn’t get much easier to whip up some holiday cheer! This peppermint-flavored smoothie is great for enjoying during the Christmas holidays.